Halftime cheers are your squad's opportunity to shine. In most cases, the squad will have at least a few minutes to perform halftime cheers, so individual talents can be showcased and bigger stunts can be performed. If the team is losing, cheerleaders can encourage fans to take heart and not lose hope. If the team is winning, then cheerleaders celebrate with the fans and pump up the energy in the crowd. The basketball players are off the floor, or the football players are in the locker room. All eyes are on the cheer squad as you take center stage to perform your halftime cheer. New squads especially can feel intense pressure at this time. It's important that the halftime routine be absolutely flawless at practice, so the cheerleaders feel confident when executing the cheer in front of fans. Even if there is a mishap, everyone should keep smiling and keep to the routine as much as possible. Halftime is the perfect time to let girls on the squad show off talents like back handsprings, back tucks and various stunts. The best halftime cheers are unique to your team and come from experiences the school has had during sporting events. If your school has a big rival team that has purple and white as its colors and the quarterback stomped off the field when they lost the last game, halftime cheers about stomping grapes can be very entertaining for your fans. Here are a few ideas to get you started. You can change any of the mascot names to match your own school mascot. Go, Eagles, go go go! Since you'll want to switch up your halftime cheers from time to time and give the fans something new to watch, your squad will want to practice the halftime cheer at each and every practice. Another option is to throw in a cheer dance instead of a cheer. 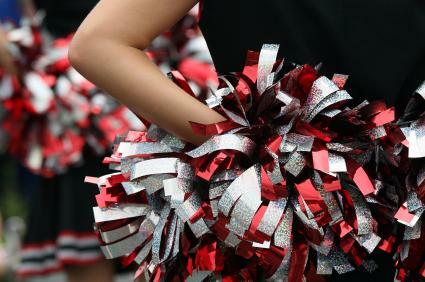 This can allow the cheerleaders to offer something new to the fans and give girls a break from difficult stunts. The halftime cheer should be as flawless as possible. Cheerleaders must learn to watch one another and keep motions tight and together. This will show fans that you take your job seriously as they will be more likely to cheer along with you.